Spitfire® is the markets most beloved power cleaner. Super-strength formula penetrates and dissolves tough soils within seconds allowing a fast and easy removal of dirt and grime. This safe and powerful all purpose cleaner gets the job done when other cleaning products can't. Remove ink, crayon, marker, adhesive, gum, food soils, scuff marks, grease, oil, and daily soil buildup from any washable surface. 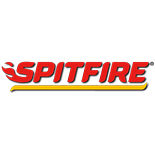 Add some fire power to your cleaning program with Spitfire®. Red in color with a fresh crisp pine scent.